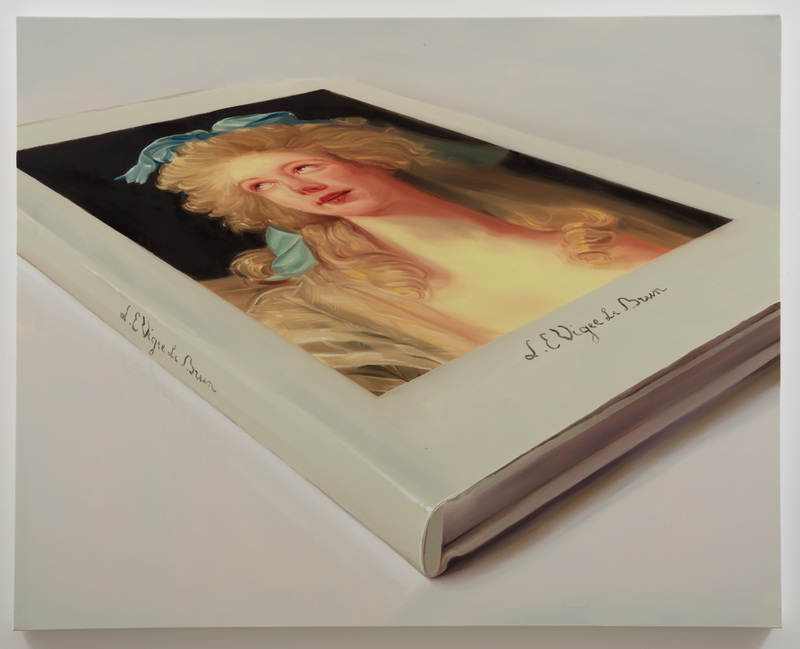 Anat Ebgi is pleased to present Book Paintings, a series of new oil paintings by Los Angeles- based artist Robert Russell. The exhibition will be on view at the gallery through June 1st, with an opening reception on April 27th, 5-7pm. Robert Russell’s new body of work depicts imagined artist-monographs laying supine on a neutral background. With this exhibition, he continues explorations of authority and iconography. On the covers, he reproduces both a famous work of art by Twombly, Guston, Currin, etc. as well as the artist’s signature. Russell’s works weave together various lineages of art history and challenge ideas of authenticity. The artist uses the artist monograph to poke at the romance of canonical legends lining the bibliotheca, or amassing atop coffee tables. Each still life entertains its general function, wherein studied subjects are faithfully reproduced. But pupil attempts to conquer master–or possess entirely–by paintstroke or hemlock, kiss or worse. Russell embraces artifice and prioritizes the superficial, negating true fidelity. Through irreverent mimesis, the canon is adjusted—an “original” experience—including both iconic artist and Russell himself. Representational painting is a sort of fakery, but these aren’t observational paintings. Despite their persuasive spines, the books themselves don’t actually exist. Acting as a conduit, the artist, within his painterly articulation, takes certain liberties which heighten the artifice of each tome. Like a mask, the reproduction is the slick illusory surface, an inherent masquerade. Homage is parody. Parody is homage. The aura of the artist, or The Portrait of Robert Russell, is bound in a book. And then sealed up in a painting. Robert Russell lives and works in Los Angeles, California. He completed his MFA at The California Institute of the Arts (CalArts) in 2006. Recent solo exhibitions include The Cabin LA, Burrard Arts Foundation (Vancouver, BC Canada), LA><ART (Los Angeles), François Ghebaly Gallery (LA), Big Pond Artworks (Munich, Germany) and Osmos (New York, NY). He has also been included in numerous group shows in Los Angeles including Roberts and Tilton Gallery, Material Press MOCA LA and M+B Gallery.